- outer diameter of the tube is 88.9 mm and the wall thickness is 1.5 mm. 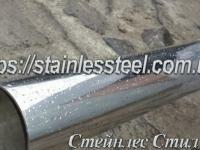 The pipe has a mirror surface of 600 grit. Designed for construction, production and decorative purposes. The appearance of such a pipe is very attractive. She is very popular in the design of residential buildings, offices and shopping complexes. The aesthetics of the mirror pipe is also important in sanitary and technical systems, in particular in sewage systems. For each batch of pipes the manufacturer’s quality certificate is provided. For decorative purposes, such a pipe is not subject to mandatory hygiene or other certification. Добротная кампания. Толковое общение с менеджером. Рекомендую.